Description: This one-year-only wooden fish lives up to his name. His is as bright as the sun with his bright yellow and green body and yellow fins. When pulled, the Sunny's body and tail move up and down in a realistic swimming motion while a hidden bell rings merrily in rhythm. 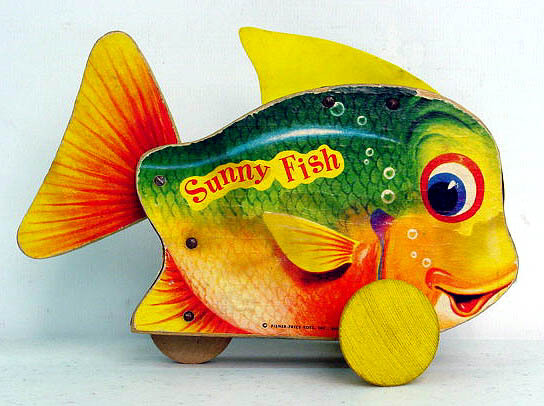 FPT4187 - Wooden cut-out with with paper lithographs on the sides and edges of a fish with big blue eyes and a bright yellow and green body marked "Sunny Fish" on the side in red. The fish has a yellow vinyl fin on top of it's body and a seperate wooden cut-out tail on the back. The tail has paper lithographs on the sides of yellow fins. The fish rolls on 3 wooden wheels, 2 odd-shaped yellow wooden wheels on the front sides and one small wooden wheel hidden under the back of the body. When pulled, the fish's body and tail move as if the fish were really swimming while a hidden bell rings. Measures 6-3/4" long, 4" high, 4" wide.